Where have all the truffles gone? Sadly, we know 2 answers. 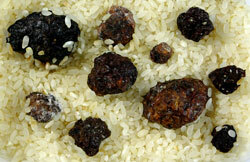 We often preserve our truffles in rice. Salem, the Oregon state capital, seems to support a higher number of quality restaurants than other cities its size, and when our travels take us there, we're often inclined to branch out and try some place new. 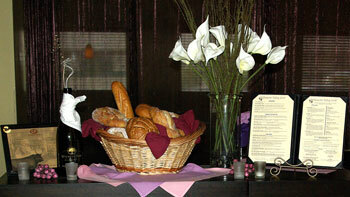 So it was on a recent trip, when in a quick search of the web, the Willamette Valley Grill caught our eye. At first glance, we had some reservations. It refers to itself as "Salem's Finest Steakhouse," (a title it may actually deserve, as it turns out) but the steakhouse genre sometimes doesn't equate to real gourmet cuisine, and is frequently rather predictable. We often feel that we can cook a perfectly good steak at home, and search for something a little different. What an elegant entrance to the restaurant! This mild winter is transforming itself into a mild spring with trees and flowers bursting into bloom. 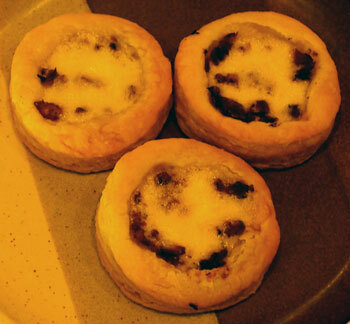 How wonderful...and that's just how we'd described Sunset's Mushroom Puffs: wonderful! We made our version with the plentiful hedgehogs that even now are fruiting in the forestlands. But we suspect that some dried mushrooms from this past fall would be equally tasty. These tasty appetizers disappeared fast! The nice folks at the highway department provide official signs on the Interstates noting (for a fee to the business owner, of course) gas, lodging and restaurants available to the traveler at the next exit. The restaurants so listed are almost always of the fast food variety, for better or worse, but we'd long ago noticed on the sign for Albany that there was one for Novak's Hungarian Restaurant. and resolved to give it a try some time. When in the neighborhood on business recently, we did just that. We're no experts on Hungarian food, but Novak's food appears to be about as authentic as can be. It should be, considering that the founding couple (Papa and Mama) are native Hungarian, and escaped that country after the infamous Soviet invasion and crackdown in 1956, eventually making their way to the States. 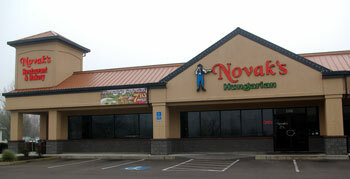 They've come a long way since then, too; Novak's is now a large and handsome place with what appears to be a devoted following.